280 pages | 29 B/W Illus. This book develops a new framework - the stakeholder model - that helps to understand corporate finance and governance in modern society, where the sources of people’s happiness have shifted from monetary to non-monetary factors. The book takes a more comprehensive approach than is typically found in the standard economics and finance literature, by explicitly incorporating both the monetary and non-monetary interests of stakeholders and by examining the value creation of corporations from a much broader perspective. 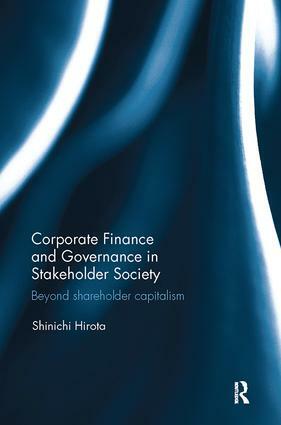 Specifically, the book addresses contemporary issues concerning corporate finance and governance worldwide, including: How should we define corporate value in stakeholder society? What is the role of modern corporations? What are the principles underlying corporate financing decisions? To what extent should shareholder rights be enhanced? What determines the effectiveness of a company’s board of directors? What missions do firms set out and what is the role of mission statements? How can we understand the diversity of financial and governance systems among different countries? What legal and institutional reforms enhance or diminish corporate value in stakeholder society? The book will answer these questions theoretically and empirically. 1. Corporations in Modern Society 2. For Whom are Contemporary Companies Managed? 3. Corporate Value in Stakeholder Society 4. Are Strong Shareholder Rights Desirable? 5. Is Governance by Shareholders Necessary? Employees’ Quiet Exit 6. The Board of Directors in Stakeholder Society 7. Corporate Finance and its Objectives 8. The Bank-centered Financial System in Stakeholder Capitalism 9. Is the Mission Statement Important? 10. How should We Evaluate Japanese Firms? Shinichi Hirota is a Professor at the School of Commerce of Waseda University. His research interests are corporate governance, corporate finance, comparing financial systems, and experimental finance. Shinichi received his PhD in economics from Doshisha University, Japan.